Kai Po Che! gets its title from a Gujarati phrase shouted in celebration during the annual kite festival in Ahmedabad. There’s reason to celebrate, as this is a great movie. If Kai Po Che! has any flaw, it’s in the way the film begins. The film opens with a man named Govi picking up another man, Omi, upon his release from prison. Omi asks where Ishaan is, and Govi explains that Ishaan will meet them at the cricket stadium. Then a subtitle reads “Ten Years Earlier” to signal the real beginning of the story. Opening with present day footage only to flash back to the real story is the trendy way to start a movie these days, but I suspect the technique will seem dated in the years to come. Rather than watching the story as it unfolds, the audience is forced to ponder questions throughout the whole movie, such as when and how Omi is going to wind up in jail. It’s distracting. However, I’m willing to forgive the opening because the technique is currently so common and because the rest of the movie is essentially flawless. The three disparate friends — Govi (Raj Kumar Yadav), Omi (Amit Sadh), and Ishaan (Sushant Singh Rajput) — are united in their struggle to figure out what to do now that they’re adults. Straight-laced Govi plans to open a sporting goods store and cricket academy, if only he can get his two layabout buddies to cooperate. The plan hinges on Ishaan, a cricket player with enough talent to be a local hero, but not enough to play in the big leagues. Having sailed through life on his athletic prowess and his family’s wealth, Ishaan is not in a hurry to grow up. Omi is the most intriguing of the three. He’s devoted to Ishaan and resents when Govi chastises the cricketer for being lazy and selfish. Omi demands respect but does nothing to earn it. As the business takes off — thanks to a loan from Omi’s shady politician uncle, Bittoo (Manav Kaul) — the three friends undergo some major changes. Govi starts a clandestine friendship with Ishaan’s younger sister, Vidya (Amrita Puri). Ishaan devotes his attention to developing the talents of a promising young cricketer, Ali (Digvijay Deshmukh). That leaves Omi on the outside, making him easy prey for ambitious Bittoo. The friends’ lives are also shaped by real-life events that occurred in Ahmedabad in the early 2000s, including a devastating earthquake. The city is rife with religious and political tension between Bittoo’s majority Hindu party and the Muslim-favored party, lead by Ali’s father. All of the circumstances allow for tremendous character growth, and the actors perform brilliantly. Yadav and Rajput get to have the most fun, with Govi growing (slightly) more rebellious just as Ishaan becomes more responsible. Sadh is fascinating as Omi. Early in the film, while Omi is still firmly in Ishaan’s thrall, there’s a dimness in Omi’s eyes. While it’s obvious that Ishaan isn’t living up to his potential, it seems like Omi has reached his: Ishaan’s toady for life. Only when Omi feels himself pushed aside for Ishaan’s twelve-year-old protege does the spark alight in his eyes, and not in a good way. The story is so well-paced and allows enough time to establish a real sense of place. Ahmedabad is shown as full of opportunity, if only nature and the people who live there will cooperate. Kai Po Che! is a nice tribute to the city and the notion of friendship that endures through dramatic changes. This entry was posted in Reviews and tagged 2013, 4 Stars, Amit Sadh, Amrita Puri, Bollywood, Digvijay Deshmukh, Hindi, Indian, Kai Po Che, Manav Kaul, Movie Review, Raj Kumar Yadav, Sushant Singh Rajput on February 22, 2013 by Kathy. Dying to watch this! And concidently, the director’s first film, ROCK ON had a similar style of storytelling with present day / flashback sequences. The only reason I’m even interested in this is because it’s Kapoor’s 2nd film. I thought ROCK ON was the 1st ever Bollywood movie about a “VHS: Where are they now” type of story that wasn’t seen before. Speaking as a fellow fan of Rock On! !, I think you’ll be satisfied with Kai Po Che, Shahid. Between this and Patang, Ahmedabad is getting a lot of screentime lately, meera. My goal is to make it there for the kite festival some day. Wow! 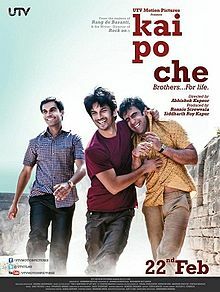 4 stars yet again, two 4 star ratings in 2 months, first Matru and now Kai Po Che. Even my predictions of movies have come right. At the end of last year I was waiting for 4 movies Matru, Special 26, ABCD and this one and so far all of them were good. Reading from your review, the beginning seems completely different from how it was in the book. Anyways I’ve booked my tickets for today’s afternoon show, will watch the movie first and then post here. You and Vivian both pointed it out, Anushka: so far, Bollywood has turned out some great movies in 2013. My favorite films of 2012 (Kahaani) and 2011 (7 Khoon Maaf) also released early in the year (March and February, respectively). I’m curious to see if trend holds for 2013. I’m traveling in India now, wondering if I could watch this film with English subtitles…well..I’m dying to see it…..
hi kathy. Always m used to read your reviews and most of the time i feel very satisfied with them, same as with ur review to kai po che. I loved the movie. Mainly coz of the realism, great performances(i liked sushant the most), mesmerising music and brilliant cinematography. And sure, Ahemdabad is a great place, visit someday. Watched the movie, am a bit dissapointed with it, was expecting a lot from the movie especially as I have read the book but it just did not live up to my expectations. As an audience I just could not connect to any of the characters and also felt a lot was missing from the movie that was in the book. Last year this happened with Shanghai and now its Kai Po Che. Sorry the film didn’t live up to the book, Vivian. As for “The Attacks of 26/11,” I’m looking forward to playing my favorite RGV game: counting how many scenes are filmed from a camera positioned underneath a glass coffee table. Right now, I’m conservatively predicting ten.